WRITING IN THE ORCHARD !!!! Writers of every level are invited to experience writing on location, or Location Writing. A casual experiential 2 hours outdoors in nature. A different location each week. 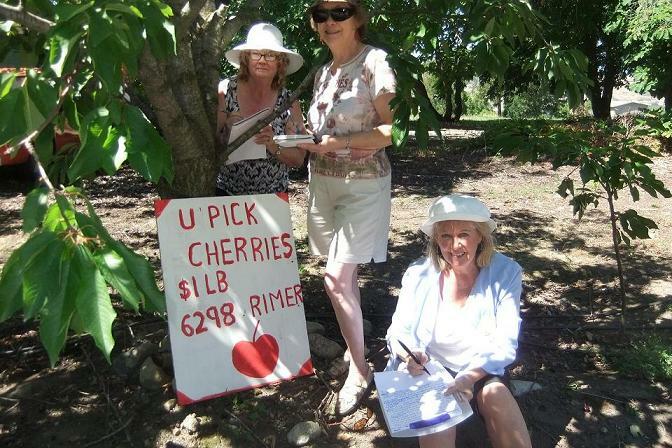 July 30th, 10 – 12 noon Be Chekovs in the Cherry Orchard !! Here is Gayle’s take on the day. I awoke full of expectation, wishing that my husband Ian would join us for the location writing, but knowing that he was not at his best in the mornings, had pretty well retired from writing and would choose to stay in bed. Since this first session was to be in a cherry orchard, I had to wear my new t-shirt ablaze with cherry-themed “bling.” I also made our morning wake-up smoothies using cherries as an ingredient. Finally heading for the orchard, I picked up my friend at her house and was glad to have her along as she knew the BX area of Vernon a lot better than I did and we found that Patricia’s directions were not exactly accurate. The orchard was a stimulating venue for writing – rows of trees laden with lush, ripened cherries that grew in thick clusters like grapes – something I wasn’t expecting. We took some pictures while listening to distant voices of U-pick enthusiasts climbing the ladders scattered along other rows and filling their pails. Soon, though, I dismissed them from my mind as we “writers” set up our chairs at various shady spots along one long path between rows of heavily laden cherry trees, just at the edge of the orchard with a fence separating us from a neighbouring apple orchard. So the writing began! Later we were surprised to find that none of us wrote what we had expected we would write. Patricia had been prepared to write poetry using coloured calligraphy pens. Instead she filled a couple of torn pages by comparing Chekhov’s iconic play, The Cherry Orchard with what she had gleaned from the orchardist’s life story. He had emigrated to Newfoundland from East Asia at age eleven, spoke with a “Newfie” accent and eventually came to own this wonderful cherry orchard in BC. When my friend, Miss P had told me about Patricia’s plans, I had responded, “Well, I’m certainly not going to write poetry. I’m not really into that.” To my surprise, I began to write a journaling-type poem about my day. 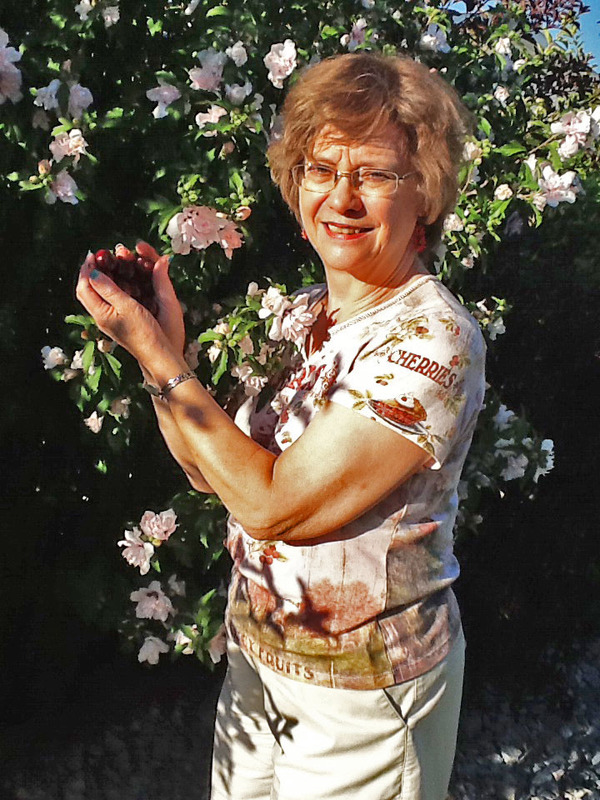 My “bling” t-shirt had inspired me to see the orchard and its surroundings as jewels. Miss P related that she had initially written some prose about the orchard and then she read us a play-on-words poem using cherries as a metaphor! Very clever! What a shiny, glorious day! Soon I will be on my way. Smoothies for Ian, more sleepy than merry. He’d rather sleep than write. What’s new?! Picked up Friend. What true devotion! We found the place, ere nails were gnawed. Apologetic she made us late. Greeted orchardist. No enthusiasm lacked. Flitting through the long, jade leaves. Ah, we loved the God-sent breeze! With all the brilliance they could muster. All make me feel that life’s a jewel. Leaving here will be too cruel! It’s like a diamond in the rough! Home at last. Sharing the morning and some cherries with the family in our shady gazebo and sunny back garden. This entry was posted in autobiographical story, Writing, Writing muses and tagged British Columbia area, Cherries, Cherry Orchard, family, Fruit, Location Writing, Patricia Donahue, poetry, Vernon, Writer's Groups. Bookmark the permalink. ← An Editor’s Musing: Why do some writers “let it all hang out” instead of editing their posts or comments? How can comments be helpful? May I simply say what a relief to find an individual who really knows what they are discussing over the internet. story. I was surprised you aren’t more popular because you definitely possess the gift. going to be a well-known blogger if you are not already. I really like what you guys tend are up to. Such clever work and exposure! Keep up the superb works guys I’ve added you guys to blogroll.